As the dog days of Summer came to a close, and the Big Dipper rose above Sean's house, that was the sign. The sign it was time to play flashlight tag! Ursa Major, harbinger of nocturnal fun. Flashlight tag is one of those games that is great no matter how many people play it. Just 3? Well then you team up with a buddy and stalk around evading capture, like a pair of burglars. 15? Then you spread out, attempting to last the longest or divert your enemy with confusion. People in the neighborhood knew who we were and these were the days of calm nights and languid days, so no neighbor thought twice of a kid sneaking through his front or back yard. The archetypal angry old man did not live in our neighborhood. Our games of Flashlight Tag would start usually at eight PM or so, and I remember them being mostly done in August, when the air began to cool but the night was unmistakably Summer. This was in an age before Summer reading, for myself any way. The Summer was purely free. I found that, as the years went on, my Summers became less and less free until Summer was indistinguishable from Fall, Winter, and Spring. In New England the seasons are clearly delineated. You can on occasion find a wintry day in Spring, or a Fall like wind in Summer, but for the most part things were kept in their place. August was a month that started with the heat of Summer, but gradually moved toward the cool and delightful air of Fall, an air that brought with it a new school year and the end of Flashlight Tag for the most part. I recall it was a Friday, and it was after my Grandfather's birthday, August 6. 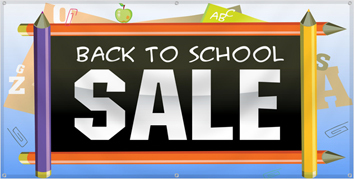 Summer was winding down; there were ads on television for "back to school sales"
Curse you back to school adverts! The big question that evening was if there was to be fifth person or not. Sean's sister, four years older than us and certainly not intertwined with our little group, had possibly agreed to play with us that evening, until she got tired. But hey, an extra player is an extra player, we wouldn't shun a girl, we saw no difference between the sexes. Not least of all because we were all guys and never really interacted with any girls. A girl was just "one of the guys" to us. For that Summer at least. Sean, being the youngest person in our little group, was always relegated to the duty of "first seeker," while he counted the rest of us scattered across the neighborhood, behind houses, up trees, trying our best to collapse our bodies against boulders and tree trunks, camouflaging ourselves. 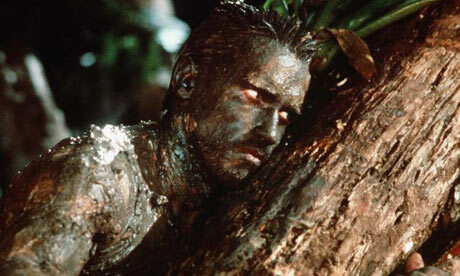 Sadly, we were not Arnold in Predator. I usually hung with Eric, who had a familial duty to protect me from any harm, including the harm of being found by a beam of light. As Sean counted at the street sign, Eric and I ran to our house while Steve headed across the street to the Putnam's yard. The hill in front of the house was covered in a thick layer of Evergreen Bush, a delightful smell but awful if you minded sap and being pricked at every inch of your body. Like these, but even thicker. My brother and I also headed towards some evergreens, the side yard of my house had a very long row of tall, sturdy, pine trees. Unlike most pine trees there were sufficient gaps between each branch and row to make the trees highly suitable for climbing. The best part of all was you could climb up one, easily jump to another and do this all the way down until you were over a hundred feet from the first tree. We always went for the evergreens. They were quick to climb, and provided good cover. Eric climbed up first and made his way from the first tree down the line. I started up but couldn't get beyond the first tree when I heard Sean's voice ring over the neighborhood "One Hundred!" With precious seconds I scrambled up the Tree and sat there, putting up my gray hood and trying to become one with nature. It didn't take Sean Long to find Steve, and together they hunted for Eric and I. I could see through the needles the beam of Sean's light make it's way over to my property. "They're probably in the trees, they always hide there." Sean said. Holding my breath, I thought small, tried to become small. I was as a pine needle, insignificant and invisible in the tree. The beam flashed mere feet from me, at the tree next to me. "I see you." I heard Sean say. A common trick, you say you see them, then, thinking they are caught your prey will willingly give up. I was not so willing, I stayed unmoved, Sean would have to be a better seeker than that to find me. And it seemed as if he would, slowly he scanned the beam up and down the tree next to mine, then, starting at the base of my tree scanned up. I would soon be trapped between a beam and the limit of the tree. I was saved by my brother, unintentionally. With a snap of a branch and a shuffle he gave away his position. Sean found him soon after and I began inching my way down the tree, I was going to continue this game as long as I could. I reached the bottom and thought of a new place to hide, the maple tree. The maple tree, a Norway Maple specifically, was the focal point of our front yard. Forty feet tall and with innumerable branches, it was a sturdy tree, fueled by endless Spring showers and Summer suns. It was difficult to get up unless you knew the trick, which I did of course. I scrambled up the tree and perched on one of the many Y-joints. I could see Sean's beam in my backyard, near the edge of the woods. Voices carried but I could not understand what they were saying. The trio made their way around the opposite side of the house from the pine trees and I examined their hunt. "Did he go into my yard?" Sean asked. "We can't tell you." Eric said. "Okay, I give up." Sean shouted to the night. "Do you really give up, or are you just saying that?" I asked from my perch. Trying to throw my voice. My attempt seemed to work, Sean spun his flashlight to the bushes at the front of my house. Then to the tree, then back to the bushes. Finally he had to concede. He turned off the light. "Yes, now come on. It's Steve's turn." Sean said as I dropped from the tree. "When did you go there?" Eric asked. "Right after you were caught, I moved because Sean was this close to finding me." I held my thumb and fore-finger close together. "You were in the pine tree weren't you? I knew it, I told you, Steve, they always go for the pine trees." We gathered at the street sign, and were joined by Sean's sister. "I can't stay long." She told us. "Just one game, okay?" Needed to make it count. Steve started counting and we split again. Eric followed Sean up the hill to Sean's house, while I fled to the end of our street, to the island. This may seem like a small area, but to a ten year old it is the whole world! Our street was a cul-de-sac, at the end of which was a circle around an island, with a diameter of fifteen feet it was not a big island but it was dominated by several large bushes. 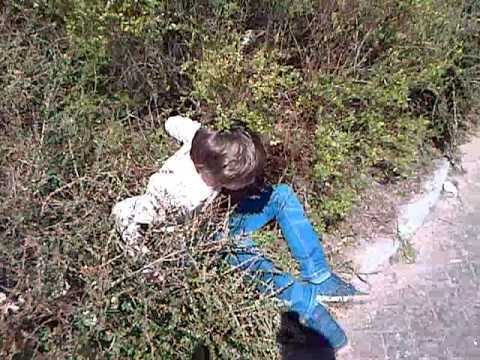 I was just the right size to slip into the bushes and hide. I was a small child, probably no taller than 4'6" and no more than 65 pounds at age 10. This was to my advantage, as I could climb up any tree, sit on any branch and have little to no risk of it cracking or breaking. I could close myself within any cupboard, inside the washing machine, anywhere there was an opening, I could get into it. I curled my body like a hedgehog and waited until Steve would give up, or, in a rarer instance, find me. That evening was on the "rare" side, as Steve found me second, after Sean's sister. She hadn't put up much of a hide, she attempted to hide behind a boulder in her yard. It was a token hide any way, she had promised to play, and she did. Now she was free to go inside. Steve had a suspicion I would go for the island, and went there almost immediately. Though my hiding spot was good, it was terrible if the person had an idea you were there, you were concealed to the casual observer, not to a master seeker. "Well, Alicia went inside so it'll be your turn next." Steve held out his hand and helped me out of my bush. "Where do you think Eric and Sean went?" "I have an idea, they wouldn't go to your place, too obvious. So they must be in Sean's backyard." I said nothing, but I had seen them move into the backyard as I went down to the cul-de-sac. We headed up the street and then up the hill to Sean's house. The rules of flashlight tag, at least how we played it, said that once you were found you had to stay with the seeker, but could not provide him any clues as to the whereabouts of the other hidden players. We briefly toyed with the rule that you could stay with the finder until you could sneak away and hide again. But this rule caused one single match to last two hours. Plus if you were the seeker it was nice to have company while you searched for the remaining players. Sean's backyard had several great places for hiding, his old swing set, the shed, and the porch, which had a lattice around the bottom. Sean and I used to crawl around under there exploring the area for "gold." Steve and I examined the whole backyard; the swing set was empty; the shed had no one within or behind. The porch was empty above and below. "Well, I guess they did go to your house." "I guess." I was no less confused than Steve, had Sean and Eric doubled back? Had they been simply one step ahead of Steve and I while we were seeking? We started around to the front when we heard something, an unmistakable giggle. "I know that laugh." Steve said. Flashing his light on the side of the house. The giggle erupted again, then there was a shuffling sound, like someone moving their feet over asphalt. Steve turned his light up to the roof, and moved back around the back of the house. Like this, but he wasn't reading a book, and it was night time. "How did you get up there?" Steve asked Sean, who was still trying to flatten himself next to the chimney of the house. Sean darted around to the other side of the roof, out of sight. "Hey, what are you doing, I caught you, Sean." Steve and I walked around to the front. Sean had to have known the game was up. As we rounded the front we heard more shuffling and then a quick shout followed by a crash. We came around the front of the house to see Sean in a bush and Eric standing above him on the roof. Steve brought the light between the two of them. "Caught you." The game continued through the evening, we had not a single watch between us and did not know what time it was. Looking from my front yard I could see, clearly, the Big Dipper positioned over Sean's house, fixed firmly in the North Western Sky. The sky was clear, the air was calm. Somewhere in the distance a dog barked. Eric and I said goodnight to the others and went inside. I slept with my window open but the fan off, the sounds of suburbia wafted through one window and out the other. The dreams were just as pleasant as reality. Looking for more from kstrom22? Ahhh. What a nice little memory to share. I could almost see myself there among you, trying to stay out of site. That is what was so nice about growing up in a small neighborhood... with houses all crammed together in close proximity. You knew everyone, and everyone knew you. You knew what to look out for... what to be suspicious of. We weren't as apt to go frolicking around in everyone's yards (except those that we frequented by invite), but it was normal for kids to be up and down the road on every manner of transit (bike, wagon, minibike, dirt bike, etc.). This reminds me a lot of times spent in that neighborhood where I grew up. I have a lot of ties here in R-town, but I didn't spend my formative years here. To visit that little addition is like stepping on holy ground. I don't go there often, because now I would only be a stranger entering somebody else's world. But to do so floods me with memories that are precious.